This past weekend, my mom said something funny to me, and I'm wondering how many other writers out there have had similar conversations with loved ones. She was up for a visit--going to attend her 50th high school reunion and staying with me and my husband. She likes to help me out (by the way, I'm an only child), which is extremely nice of her and above and beyond. While she was helping me out this weekend, she said this "funny" thing. I had two baskets of clean laundry sitting in a spare bedroom, and she was folding it for me. She asked me how long it had been in the baskets, and I said about four days. 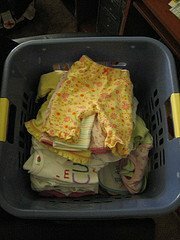 I told her sometimes I don't have time to fold it and put it away; but since it is clean, I just get my clothes out of the basket when I get dressed. Since the basekts are in a spare room, I can just shut the door if company comes over. Her comment to me was. . .
"How do you live like that?" I laughed and said, "There are a lot of writers who 'live' much worse than that." To me, it is perfectly logical to leave clean laundry in a basket, so I can work on my novel or write a blog post. It is perfectly logical to buy Downy Wrinkle Release and spray it on my clothes in the morning instead of spending my writing time ironing. It is okay to leave a few dishes in the sink and not unload the dishwasher yet, so I can interview someone for an article. I am not a slob--I have a clean house, and it is actually pretty neat, but I am a writer--first and foremost, and I can "live like that" because I know what I am passionate about. I know what I need to do each day. I know what is begging to come out of me. It's words and creatvity and stories--not desire to have a perfect house. I am NOT passionate about laundry or dishes, and therefore, I can live like that. I'll just try a little harder when my mom comes to visit. :) The rest of the time, my writing comes before cleaning, that's just the way it is. My husband understands that--thank goodness! I'm with you all the way on that one. I HATE putting laundry away, hanging it up only to take it down again. I tell myself my time is worth more than that. As long as no one is going to school/work naked, that's just fine with me. I am the same way. Glad to read this. Amen!! Laundry can wait...ideas will soon go out of my head. There are just some things that have to be put to the side when inspiration hits you...and laundry is at the top of my list...lol. My husband finds it funny because he puts his laundry up as soon as it comes out of the dryer and mine sits in a basket until the next load is ready. We've only been married for 2 1/2 years...he's getting use to it. I can SO relate! I HATE folding laundry. That's why my husband does it, and it's usually four days after we've done the laundry. Oops.